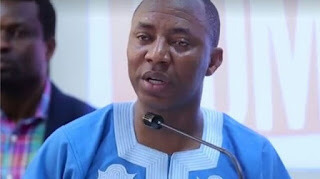 Omoyele Sowore, publisher of Sahara Reporters and presidential aspirant for the 2019 election, says Senate President Bukola Saraki will be sent to jail and that Kwara will be “liberated”. Sowore said this on Friday when he visited Ilorin, Kwara state capital, for a town hall meeting. Saraki is from Kwara state. Sowore said the number three citizen had turned himself into a “demigod” in the state. He told the crowd who received him that he would put an end to the politics of godfatherism in Kwara and Nigeria as a whole if he is voted into power. Sowore said the country would experience a “revolutionary change” in government by 2019. Sowore further said the All Progressives Congress (APC) government has failed the nation, hence it “should be kicked out”. According to him, by 2019, “it will no longer be sai Baba but sai Bobo”. “By next year, we are taking back this country from the hands of the old guards and we would ensure we set its feet on the path of progress,” he said.